Imagine today is August 3rd, 1977. Would you like to buy a home computer? Here is the config you will most likely be getting – 4 KB of RAM which could be expanded to a whopping 16 KB. That was the config of the first home computer that was announced today, 33 years ago – the TRS-80. It was subsequently launched in December 1977. This first model costed about $600 which made it a little affordable however that would have been worth about $2,160 today. While the TRS-80 was out other companies including Apple, HP, IBM and Wang had personal computers as early as 1970s. They were expensive, for instance the Apple I and II would cost $1298 for 4 kB of RAM and $2638 for 48 kB of RAM – that’s not cheap! 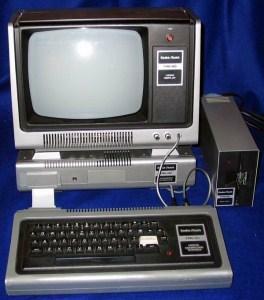 Radio Shack reported that the Model I TRS-80 recieved about 10,000 orders the first month and it took months before they were delivered to customers. Radio Shack sold 200,000 units in four years. TRS-80 stood aside from its competitors and the reason being that there was lots of software for it. The TRS-80 was compatible with lots of software and lots of people contributed to it, thanks to the huge sales for the product. Home computers are extremely powerful these days, and eons ahead of what was offered in 1977. However we can’t be any less thankful to the technology back then that served as the foundation for our success.